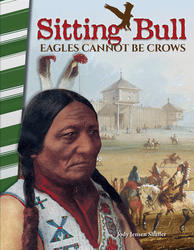 The SITTING BULL: EAGLES CANNOT BE CROWS primary source reader builds literacy skills while offering engaging content across social studies subject areas. Primary source documents provide an intimate glimpse into what life was like during the 1800s. This nonfiction reader can be purposefully differentiated for various reading levels and learning styles. It contains text features to increase academic vocabulary and comprehension, from captions and bold print to index and glossary. The “Your Turn!” activity will continue to challenge students as they extend their learning. This text aligns to state standards as well as McREL, WIDA/TESOL, and the NCSS/C3 Framework.